Totum Research Inc., one of Canada's leading media research organizations, conducted a survey to determine news media and advertising preferences. Local news is most important to Albertans, more than any other. The research makes it clear. The majority of people follow all types of news most of the time. There is a stark difference between rural and urban communities. Respondents follow local news most of the time. International, national and provincial news are followed most closely by people who read the local newspaper in printed and/or online format. 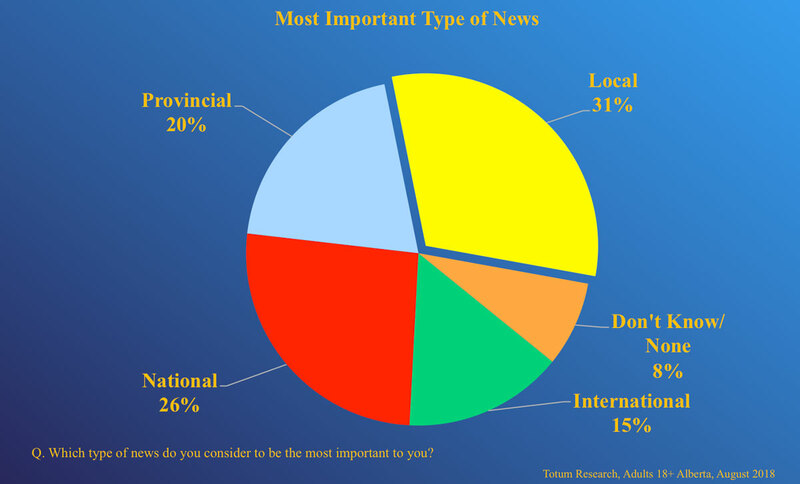 Local news is most important to more Albertans than any other type. The printed local newspaper is the preferred source for all local information including news about people, events, jobs, businesses or sales and schools. The printed local newspaper - preferred for info about local government programs and initiatives. Television and the printed local newspaper - preferred sources for info about provincial government programs and initiatives. 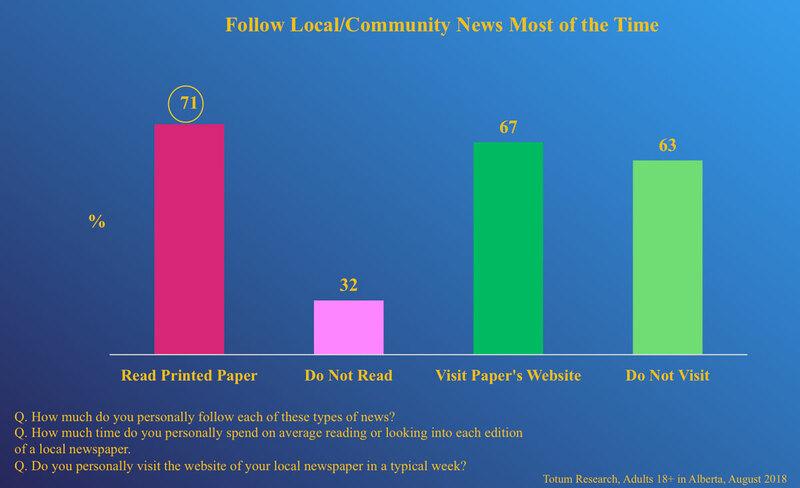 The printed local newspaper is the most trusted medium for news and advertising. Two respondents in five distrust news and advertising in social media. 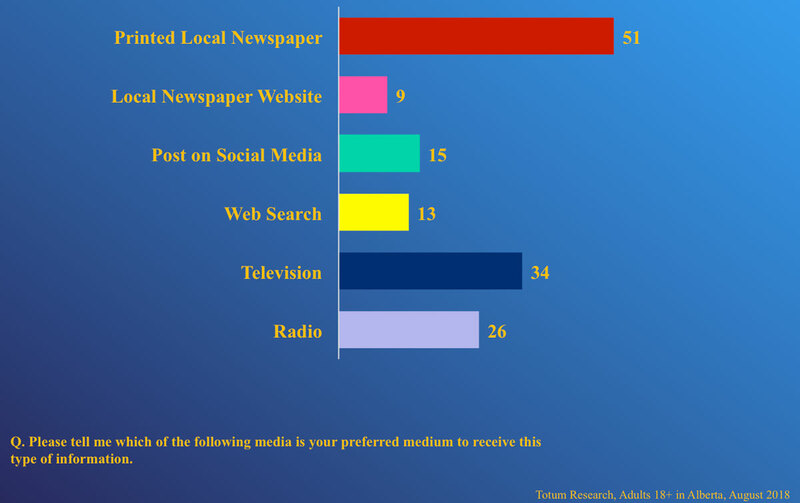 60% or more of the respondents receive the printed local newspaper at home. 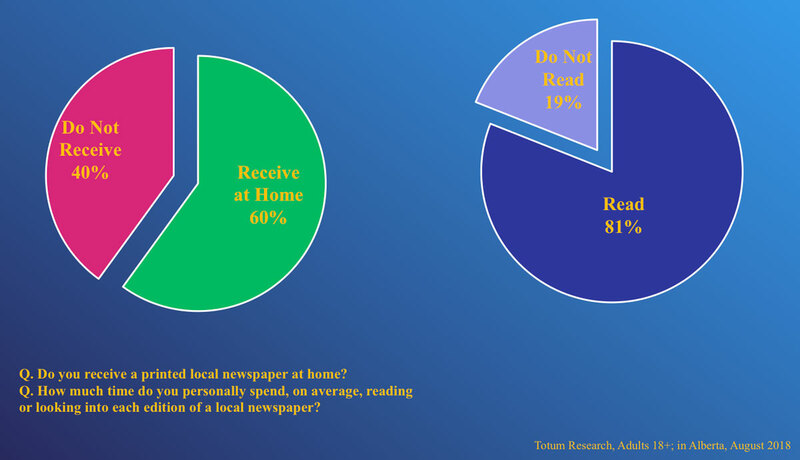 80% read a typical issue of the printed local newspaper weekly. 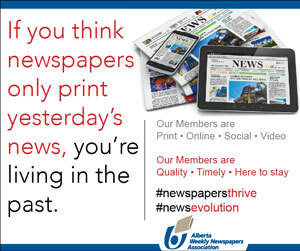 The average time spent reading the printed local newspaper is 22 minutes per issue. The typical issue has an average of 1.5 readers per household. 16% of respondents also visit the local newspaper’s website weekly spending almost 20 minutes on the site. While significant numbers of people are involved in various online activities, for many of these activities half or more say their internet connection impacts their level of involvement. 15% of respondents have no internet access. The most important activities for people with internet connection are email, texting and researching products and services. The vast majority of online participants spend 15 minutes per day or less on any one activity. 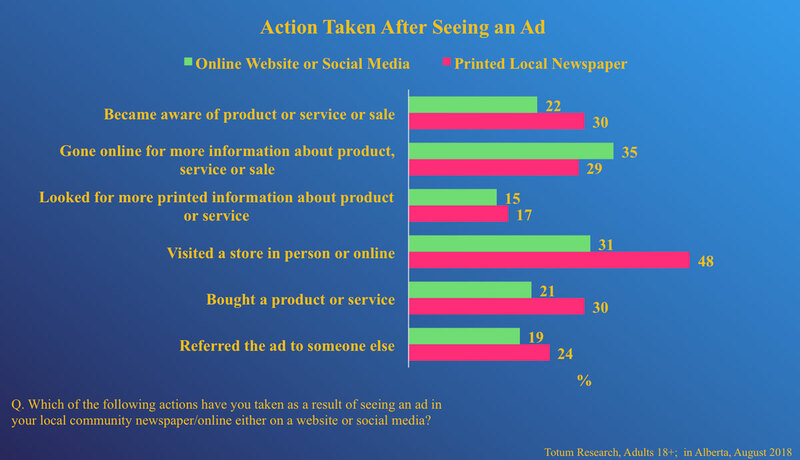 More than 2 in 5 respondents find ads in the printed local newspaper useful. 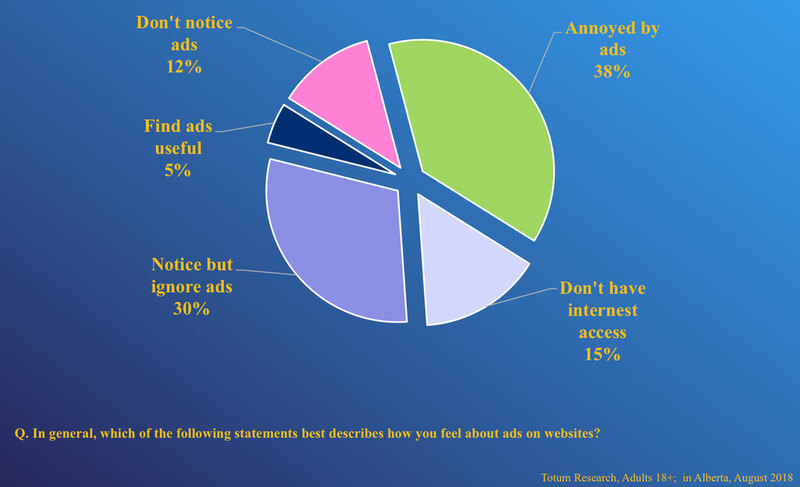 By contrast, 80% of respondents ignore, don’t notice or are annoyed by ads on websites. Up to 30% of respondents use an ad blocker to avoid digital advertising. While fewer than 40% of respondents occasionally click on digital ads intentionally, almost 60% say they occasionally do this accidentally. Irrelevance, privacy and security were the most common reasons for respondents to avoid clicking on digital ads. through the Canada Periodical Fund of the Department of Canadian Heritage.